The Nexus 10 is a tablet computer co-developed by Google and Samsung Electronics that runs the Android operating system. It is the second tablet in the Google Nexus series, a family of Android consumer devices marketed by Google and built by an OEM partner. Following the success of the 7-inch Nexus 7, the first Google Nexus tablet, the Nexus 10 was released with a 10.1-inch, 2560×1600 pixel display, which was the world's highest resolution tablet display at the time of its release. 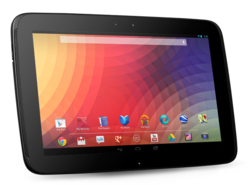 The Nexus 10 was announced on October 29, 2012, and became available on November 13, 2012. Original: Android 4.2 "Jelly Bean"
The device is available in two storage sizes, 16 GB for US$399 and 32 GB for US$499. Along with the Nexus 4 mobile phone, the Nexus 10 launched Android 4.2 ("Jelly Bean"), which offered several new features, such as: 360° panoramic photo stitching called "Photo Sphere"; a quick settings menu; widgets on the lock screen; gesture typing; an updated version of Google Now; and multiple user accounts for tablets. Google was scheduled to launch the Nexus 10 along with the Nexus 4 and Android 4.2 at a conference event in New York City on October 29, 2012, however, the event was cancelled because of Hurricane Sandy. Instead, the device was announced the same day in an official press release in Google's blog, along with the Nexus 4 and the 32 GB, cellular connectivity-capable Nexus 7. The Nexus 10 became available for sale in the United States, the United Kingdom, Australia, France, Germany, Spain, and Canada on November 13, 2012. Japan was supposed to be included in the November 13 launch but the release was postponed. The tablet became available on February 5. The Nexus 10 went through repeated patterns of availability across international Google Play Stores, while the 32GB version was more consistently out of stock. The 32GB Nexus 10 was sold out within hours of its release in Google Play, while the 16GB version was still available for sale. Google Play stores in the United States and Canada received the Nexus 10 and quickly sold out. The Nexus 10 shipped with Android 4.2 ("Jelly Bean") as its operating system and is upgradable to Android 5.1 ("Lollipop") since March 9, 2015. It ships with preinstalled applications, such as Google Chrome, Gmail, Play Music, Play Books, Play Movies, the Play Store application, YouTube, Currents, Google+, Maps, and People. The Nexus 10 features a Samsung Exynos 5250 system on chip, a dual-core 1.7 GHz Cortex A15 central processing unit and a quad-core ARM Mali T604 graphics processing unit. The device also includes a primary 5-megapixel, rear-facing camera with LED flash, able to shoot 1080p video at 30 frames per second and take 2592×1936 resolution images with features such as autofocus, face detection and geotagging, and a secondary 1.9-megapixel, front-facing camera. It is encased in a plastic chassis and the rear of the device comprises a smooth, plastic surface, except for a strip of removable, dimpled plastic material, similar to the Nexus 7's rear, that hides FCC brandings. The rear of the Nexus 10 also includes a large "nexus" branding, for the line of mobile devices it belongs to, and a smaller "Samsung" branding, for the manufacturer of the device. There is, also, no mention of Google, the device's distributor and the maker of the Nexus 10's operating system, Android, on its hardware. On the top of the Nexus 10 are the volume controls and the power button, on the left side of the device lies a 3.5mm headphone jack and a microUSB port, used for charging or connecting the device to a PC or other USB-compatible device. On the right side of the device, there is only a microHDMI port and at the bottom, there is a magnetic pogo pin used for docking and charging. A 9,000 mAh lithium polymer battery powers the Nexus 10, and is reportedly capable of 9 hours of video playback, 90 hours of audio playback, 7 hours of web browsing, and 500 hours (20.8 days) of standby time. The Nexus 10 has a 10.055 inches (255.4 mm) liquid crystal display with a 2560×1600 WQXGA display resolution, giving it a pixel density of 300 pixels per inch and a 16:10 aspect ratio. The display also features a "True RGB Real Stripe PLS" TFT panel and a capacitive, multi-touch screen, protected by scratch-resistant Corning Gorilla Glass 2, and is capable of displaying over 16.7 million colours. The Nexus 10 received mixed-to-favorable reviews. TechCrunch columnist Drew Olanoff said that Android was a better experience on a tablet than iOS and concluded "Apple has an advantage, but Google is right there on the cusp of something amazing,"
The Gadget Show called the Nexus 10 "the best 'big' Android tablet we’ve ever seen. The screen alone puts it ahead of the competition, the screen on the Google Nexus 10 is phenomenal. It’s every bit as stunning as the Retina Display on the third and fourth generation iPads. It really has to be seen to be believed: it’s like a printed sticker on the glass, and makes reading a delight." Tim Stevens of Engadget says "Google's latest reference tablet packs an amazing resolution but ultimately fails to distance itself from the competition." Eric Franklin of CNET states "[...] the Nexus 10 has superior design and performance, and the features available in Android 4.2 may be worth price of admission alone." James Rogerson of TechRadar wrote "Ultimately, other than the price, there's little reason for Apple fans to jump ship to the Nexus 10, equally the Nexus 10 puts up enough of a defence to keep the Android faithful happy." Laptop Magazine, CNET, and PCWorld all rated the Nexus 10 at 4 out of 5 stars, while TechRadar gave the device 4.5 stars out of 5. PC Magazine and Wired gave the device a rating of 3 out of 5, and 8 out of 10, respectively. Commentators noted the lack of an SD card slot for expandable storage, absence of cellular connectivity, low color contrast and saturation, and limited selection of tablet-optimized Android apps, while praising the Nexus 10's high display resolution, powerful, high-performance processor and contemporary user interface. ^ a b c d e f g h "Samsung Google Nexus 10 P8110 - Full phone specifications". GSMArena.com. ^ "Nexus 4 and Nexus 10: A Closer Look". AnandTech. Retrieved 2012-11-20. ^ a b "Samsung Google Nexus 10 P8110". GSMArena. Retrieved 7 December 2012. ^ a b Cunningham, Andrew (11 November 2012). "Review: Nexus 10 tablet is a solid house built on shifting sands". ArsTechnica. Retrieved 1 December 2012. ^ "Nexus - Google+ - Earlier today, we began selling three new Nexus devices…". Plus.google.com. Retrieved 2012-11-20. ^ Stern, Joanna (27 October 2012). "Hurricane Sandy Prompts Google to Cancel Android Event". ABC News. Retrieved 28 October 2012. ^ a b Rubin, Andy (29 October 2012). "Nexus: The best of Google, now in three sizes". Retrieved 29 October 2012. ^ Kitahama, Shinya (5 February 2013). "Nexus 10がついに国内発売スタート". Gizmodo. Retrieved 5 February 2013. ^ "Google Nexus 10 goes back on sale, again". PC Advisor. Retrieved 2012-02-17. ^ Dobie, Alex (13 November 2012). "Nexus 4 and Nexus 10 launch on Google Play Store in U.S. + Canada". Android Central. Retrieved 24 December 2012. ^ Smith, Mat (13 November 2012). "PSA: Google Nexus 4, Nexus 10 for sale in US now!". Engadget. Retrieved 24 December 2012. ^ a b c d e f g Rogerson, James (6 November 2012). "Google Nexus 10 review". Tech Radar. Retrieved 1 December 2012. ^ "Android: Be together. Not the same". officialandroid.blogspot.com. Retrieved 25 October 2014. ^ a b c d Pierce, David (2 November 2012). "Google Nexus 10 review". The Verge. Retrieved 1 December 2012. ^ Nguyen, Vincent (2 November 2012). "Nexus 10 Review". SlashGear. Retrieved 1 December 2012. ^ Olanoff, Drew (2 November 2012). "Review: Google's Android OS Might Be Better Suited For Tablets, And The Nexus 10 Is A Shining Example". TechCrunch. Retrieved 23 December 2012. I’ve found that iOS still is the better phone operating system for me. However, when the Nexus 7 came out, I found that I used it way more than I ever used my iPad. Perhaps this could be a fluke, or maybe it’s because of the 7-inch form factor. That’s until I picked up the Nexus 10 and realized that Android OS is, for me, the better “bigger screen” tablet experience. I have a first-generation iPad and never pick it up. ^ Olanoff, Drew (2 November 2012). "Review: Google's Android OS Might Be Better Suited For Tablets, And The Nexus 10 Is A Shining Example". TechCrunch. Retrieved 23 December 2012. ^ "Google Nexus 10". The Gadget Show. ^ a b Stevens, Tim (2 November 2012). "Nexus 10 review". Engadget. Retrieved 23 December 2012. ^ a b Franklin, Eric (2 November 2012). "Google Nexus 10 Review". CNET. Retrieved 23 December 2012. ^ "Samsung Nexus 10 Review and Specifications". Pro Reviews. Retrieved 24 December 2012.